If you are away from home or spending a long time on the White Isle, you can keep up your yoga practice up easily with these great classes. With its hippie heritage, laid-back vibe and beautiful nature that's just made for being outdoors, it's no great surprise that Ibiza offers all kinds of yoga courses and retreats for aficionados and for those starting out. Sometimes though, you just need a drop-in class to, well drop into to keep your practice going. If you are on holiday or spending a reasonably long amount of time here, a good drop-in class could be just what you need to stay limber, whilst still enjoying the island. With so many different types of yoga out there, Ibiza Spotlight went on tour to give you a full range of drop-in classes covering many yoga forms that are available on Ibiza. We tried just about everything from the daringly dynamic, to the soft and gentle to suit the varied needs of everyone. With all the classes we reviewed, it is better to have some grounding in yoga, though beginners are welcomed. The classes are mostly given in English, with many offering a side explanation in other languages too. All you need now do is read on and find the one for you. Pure Om has classes through the week of many different varieties. Soft yoga is for when you want to do a more gentle practice or if you are an absolute beginner. It is suitable for all ages and abilities. Lija leads you through a gentle set of poses and explains everything in a beautifully calm manner. The best way to explain it, would be to call this a soft-dynamic style of yoga, that's perfect for all. A lovely session, where you will come out feeling bright and energetic, yet at the same time, very relaxed. Because this class isn't too difficult, it means that you still keep up your practice and feel like you've done something. Yoga is about not pushing and that's what this class gives the body, to stay within your limits. Stepping out into blazing sunshine after this class felt like walking on air. Nicole at Elevate gave us what was an amazing and beautiful class to get the day started. Each week, the focus of the class changes, so you will do something different such as clearing toxins or laying down a foundation to build energy; this means you will work focusedly on the chakras either one by one or in combination. It's said that this form of yoga is the original one as practised by Hindu holy men over millennia. It is in fact a synthesis of yoga traditions that uses chanting, meditation and visualisation as well as dynamic poses. Quite simply: magical. The classes take part in a rustic studio surrounded by trees and nature. Nicole is lovely and will make you feel easily at ease. I walked out there, floating and very relaxed, with the instruction to take it easy that day. I still had to start my day of work, though I didn't “attack” the day; instead, I let the calmness I'd engendered guide me through my to do list. If you like the spiritual side of yoga or have a particularly active mind that needs quieting, you'll love this class. Hatha yoga has been for around in the west for a long time. Essentially, it's a mix of medium power postures with proper breathing integral to it. Chandra Ibiza's yoga classes have a lovely meditative warm up to start with, all guided by the soft, gently commanding voice of the teacher Nora. Then it's time to get into the series of poses that follow where you will work with the chakras. As well as the regular classes that take place during the week, an unmissable event is the new monthly “Sound Yoga”, a journey of sound and music vibration, created by gongs and bowls, combined with hatha yoga postures and breathing. A superb adjunct to normal yoga practice that helps unblock energy and stagnant thoughts and bring you to the present, all using the resonance of sound that will return the body to natural functioning. In both the regular class and Sound Yoga, you are guided throughout by the very encouraging Nora, who takes you on what we thought was a rather magical journey. The class will give you much needed focus and attention on the body for regular maintenance. Doing the sound class once a month, should super-charge your body, making it ready to take on anything. A class from a long-time Ibiza master Marrejan Oepkes, that is simply beautiful. Yin yoga is unlike other forms you may have tried as it works slowly on a deep muscular level. Marrejan believes that the yin approach is the perfect counterbalance to all the negativity we see in the news or on social media. There are fewer poses overall and you stay in them, stretching for around three to five minutes apiece. 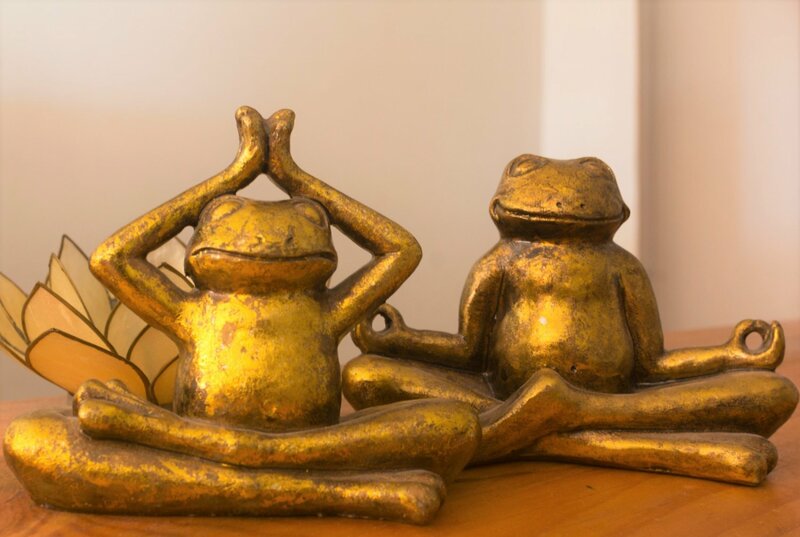 On the day we went, it was a full moon in Gemini, which according to our teacher makes you likely to have a short fuse, so that day we worked specifically on poses to aid anger management. The class attracts an older crowd, though people any age could go. We loved this class a lot. Marrejan puts a limit on numbers so that each person gets enough attention and guidance. If you haven't done it yet, know that the deep work that this entails will mean, you'll probably want to go home, avoid alcohol, junk food and go straight to sleep. Waking up the next day will have you super refreshed and you will notice you've used some muscle groups. Perhaps the best way to some sum it up the approach of this class is in Marrejan's own words: “the paradise you are looking for is already inside you, yoga helps you achieve that”. The “flow” part of the name is what you need to know. Vinyasa pulls together various poses all co-ordinated with breathing. Our teacher Davy of Yoga Projects Ibiza organised a session just for us in this countryside yoga centre. In summer, you can practise on the roof; being a chilly day we went for an inside job. Davy really knows his stuff and is sensitive and gentle with you. We did a gentle flow, though intensity can be increased. This class is a kind of yoga therapy, where you'll be shown how to perfect poses, become more aware of the body and notice your breathing much more. I had been concerned that this was a power form of yoga. It is not. The two-hour class went by quickly and we fitted a lot in. You'll notice your thoughts stilling quickly because of the way and speed by which you move from one pose to another. It's dynamic yes, taxing, no. After finishing and leaving to see a shining sun, then walking past lemon and banana trees, we thought that life could not get much better. Yoga Projects Ibiza also works out of Beachouse and Atzaro. With perhaps one of the most amazing sunset views around, the setting for yoga classes at Cotton Fitness is quite lovely, especially during the warmer months as the action takes place outside. These classes have elements of both yang (dynamic) and yin (passive) yoga in the three weekly classes. Mondays are mainly yin, Wednesdays are for gentle yang and yin and Saturdays mainly yang. Here, the teacher adapts to the needs of the class, asking at the start how passive or active participants want it to be. As well as a core all-year crowd, summer sees many tourists join in. We did the Wednesday combo, which was in a gym room with the lights out, a refreshing change to having studio lights beaming on you late at night. It makes for a good general drop-in class and certainly come summer when you can step outside, expect bayside bliss.